Distributed and Cloud Computing: From Parallel Processing to the Internet of Things offers complete coverage of modern distributed computing technology including clusters, the grid, service-oriented architecture, massively parallel processors, peer-to-peer networking, and cloud computing. It is the first modern, up-to-date distributed systems textbook; it explains how to create high-performance, scalable, reliable systems, exposing the design principles, architecture, and innovative applications of parallel, distributed, and cloud computing systems. Topics covered by this book include: facilitating management, debugging, migration, and disaster recovery through virtualization; clustered systems for research or ecommerce applications; designing systems as web services; and social networking systems using peer-to-peer computing. The principles of cloud computing are discussed using examples from open-source and commercial applications, along with case studies from the leading distributed computing vendors such as Amazon, Microsoft, and Google. Each chapter includes exercises and further reading, with lecture slides and more available online. 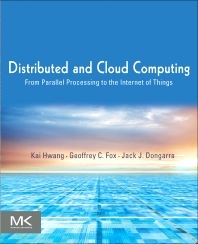 This book will be ideal for students taking a distributed systems or distributed computing class, as well as for professional system designers and engineers looking for a reference to the latest distributed technologies including cloud, P2P and grid computing. Students taking a distributed systems or distributed computing class; also professional system designers and engineers looking for a reference to the latest distributed technologies including cloud, P2P and grid computing. Kai Hwang is a Professor of Computer Engineering, University of Southern California and an IV-endowed visiting Chair Professor, Tsinghua University, China. He earned the Ph.D. in EECS from University of California at Berkeley. An IEEE Life Fellow, He has published extensively in computer architecture, digital arithmetic, parallel processing, distributed systems, Internet security, and cloud computing. He has founded the Journal of Parallel and Distributed Computing and delivered three dozens of keynote addresses in major IEEE/ACM Conferences. He received the 2004 Outstanding Achievement Award from China Computer Federation and the IEEE 2011 IPDPS Founders' Award for his pioneering contributions in the field of parallel processing. Jack Dongarra is a University Distinguished Professor of Electrical Engineering and Computer Science, University of Tennessee, a Distinguished Research Staff, Oak Ridge National Laboratory and a Turning Fellow at the University of Manchester. An ACM/IEEE/ SIAM/AAAS Fellow, Dongarra pioneered the areas of supercomputer benchmarks, numerical analysis, linear algebra solvers, and high-performance computing and published extensively in these areas. He leads the Linpack benchmark evaluation of the Top-500 fastest computers over the years. Based on his high contributions in the supercomputing and high-performance areas, he was elected as a Member of the National Academy of Engineering in the USA. Geoffrey Fox is a Distinguished Professor of Informatics, Computing and Physics and Associate Dean of Graduate studies and Research in the School of Informatics and Computing, Indiana University. He has taught and led many research groups at Caltech and Syracuse University, previously. He received his Ph.D. from Cambridge University, U.K. Fox is well known for his comprehensive work and extensive publications in parallel architecture, distributed programming, grid computing, web services, and Internet applications. His book on Grid Computing (coauthored with F. Berman and Tony Hey) is widely used by the research community. He has produced over 60 Ph.D. students in physics, computer science and engineering over the years.